Posted on August 22, 2016 at 11:49 am. Are you looking to get your truck licence or upgrade you existing truck licence in Brisbane? 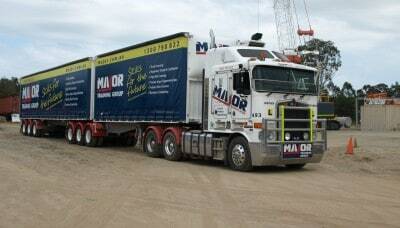 Major Training offers daily heavy vehicle training Brisbane, Gold coast, Ipswich and Sunshine coast. With one of Queensland’s largest training fleet of modern vehicles and equipment, Major training holds Truck lessons by the hour as well as intensive in-house courses that range from 1 to 3 days (depending on experience) held from Monday to Saturday so you can choose a time that suits you. Our highly experienced, friendly and approachable trainers can teach you one on one how to drive MR, HR, HC or MC trucks and can help you on the path to successfully gaining your licence. We don’t make promises that you will get your licence, but we will give you the best opportunity with one on one training, qualified industry trainers, and depending on the heavy vehicle training you are going for up to 12 hours of lessons to make sure you are confident behind the wheel. Our heavy vehicle licence trainers will not put you forward for your license if they don’t believe you are ready for your assessment and will spend more time on the things that you need to work on, as every student is different. With over 20 years’ experience in teaching people how to operate equipment and drive trucks Major Training prides themselves on quality training and producing competent drivers. If you are interested in getting your licence with a reputable training organisation, give major a call on 1300 790 822 or fill out the form below & one of our course advisors will be in touch. What truck licence are you interested in?